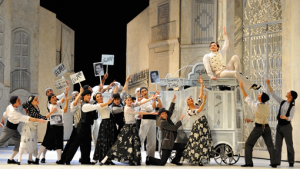 If Gioachino Rossini were to revisit today’s opera scene, he’d probably have mixed feelings about the remarkable tenacity of The Barber of Seville in the repertoire. (Rossini loved to joke about the advantage of being born on February 29, which would make him a middle-aged man of 55.25 in leap year terms, not a Methuselah of 221.) Mixed because, though he certainly recognized Barber as a work di qualità—as Figaro asserts of his own profession—its popularity still distorts Rossini’s versatile legacy.